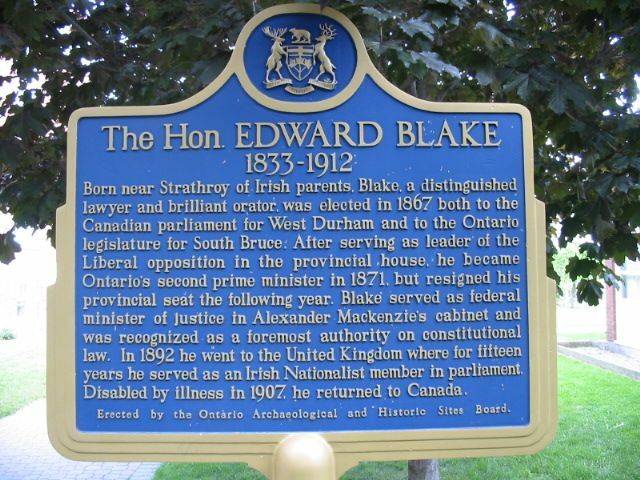 Born near Strathroy of Irish parents, Blake, a distinguished lawyer and brilliant orator, was elected in 1867 both to the Canadian parliament for West Durham and to the Ontario legislature for South Bruce. After serving as leader of the Liberal opposition in the provincial house, he became Ontario's second prime minister in 1871, but resigned his provincial seat the following year. Blake served as federal minister of justice in Alexander Mackenzie's cabinet and was recognized as a foremost authority on constitutional law. In 1892 he went to the United Kingdom where for fifteen years he served as an Irish Nationalist member in parliament. Disabled by illness in 1907, he returned to Canada.